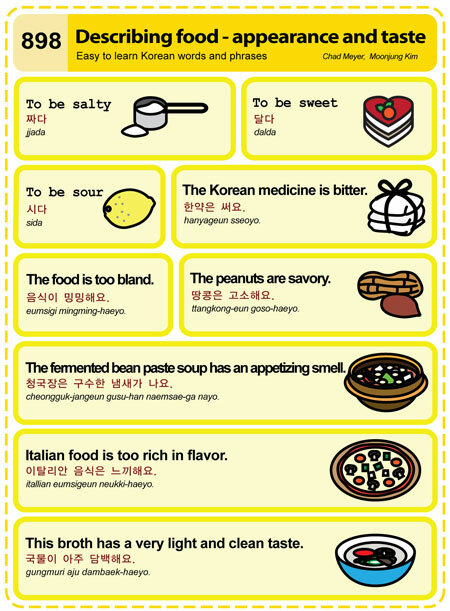 Easy to Learn Korean 898 – Describing Food – Appearance and Taste. This entry was posted in Series and tagged appearance, bitter, bland, fermented bean paste soup, food, Italian food, medicine, peanuts, rich, salty, savory, smell, sour, sweet, taste, 달다, 땅콩은 고소해요, 사다, 음식이 밍밍해요, 이탈리안 음식은 느끼해요, 짜다, 청국장은 구수한 냄새가 나요, 한약은 써요 by easykorean. Bookmark the permalink.